United Arab Emirates (UAE) Thursday announced it ended the mission of its non-resident ambassador to North Korea and that of the non-resident North Korean envoy to the Gulf country. The move also hit the Korean companies operating in the seven Emirates making the Gulf country. 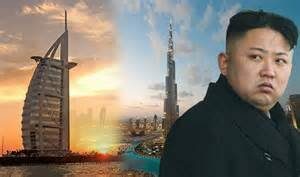 The Emirati state news agency, WAM notes that the US ally also has ended issuing visa for North Korean nationals. There are up to 1,300 North Koreans working in the UAE. US President Donald Trump has called on all US allies to cease cooperation with Pyongyang in order to scale up pressure on the Asian country so that it abandons its missile program. Japan and South Korea, both neighbors of the rogue state, have also pressured Gulf countries to stop employing North Korean workers. Kuwait in September significantly downgraded ties with North Korea, asking North Korean workers to leave and prohibiting Kuwait companies to deal with their North Korean counterparts. Qatar, which will host FIFA 2022 World Cup, said it stopped issuing visa for North Korean workers as of 2015. There are still 1,000 workers in the small emirate but the government noted that their number will significantly decrease as their employment contracts edge towards expiration. Written by: KanelkaTagba on October 13, 2017. Posted by KanelkaTagba on Oct 13 2017. Filed under Headlines, World News. You can follow any responses to this entry through the RSS 2.0. Both comments and pings are currently closed.